Star Trek director and long-term Star Wars fan J.J. Abrams brings these intriguing plot strands together with consummate skill to launch a spectacular new trilogy. It's three decades on from the events of Return of the Jedi. On the desert planet Jakku, tough loner Rey (Daisy Ridley) plies her trade as a scavenger. Meanwhile, a stormtrooper named Finn (John Boyega) finds himself in great danger, the villainous Kylo Ren (Adam Driver) wields a cool cross-form lightsaber, and an X-Wing pilot named Poe Dameron (Oscar Isaac) is sent on a mission by "a certain princess". Star Trek director and long-term Star Wars fan J.J. Abrams brings these intriguing plot strands together with consummate skill to launch a spectacular new trilogy. 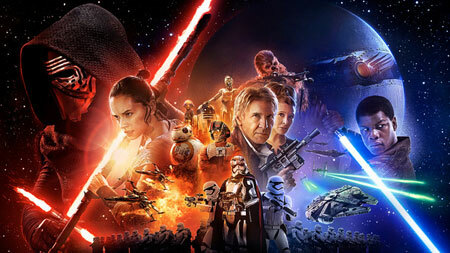 Mark Hamill, Harrison Ford and Carrie Fisher are among the returning members of the original Star Wars cast. And motion capture king Andy Serkis is also on board as Supreme Leader Snoke, who is very much on the Dark Side of the Force.